A M551 Sheridan fires an anti-tank Shillelagh missile. Anti-tank Guided Missile (ATGM), or simply Anti-tank missile, refers to a missile system specialized in destroying heavily armored vehicles such as tanks. The advent of anti-tank missiles in War Thunder started in Update 1.59 "Flaming Arrows" with the introduction of various of vehicles mounting an anti-tank missile. Each country received one, and additional were added in future updates. Most are available through unlocks, with the British Strv-81 being premium. The defining terms between a "rocket" and a "missile" is the presence of a guidance system on the warhead. A rocket flies by its trajectory and once released, is free to fall wherever it lands. A missile on the other hand has access to computer technology to send the guided warhead wherever the operator desires with the usage of a joystick or a laser sight. In Arcade Mode, all ATGM launchers use the second-generation guidance system. Thus, once fired, keep the cross hair on the desired target to lead the missile. Keep in mind the missile trajectory as it has a very sensitive fuse so make sure it does not prematurely explode on a piece from the environment. First-Generation: Also known as MCLOS, this missile requires manual input from the controller to control it. Use the default movement keys WASD to move the missile. A to steer left, D to steer right, W to steer down and S to steer up. Note that while you are controlling the missile, you will not be able to move from your firing position so make sure you are in a safe place. Second-Generation: Also known as SACLOS, this is a lot simpler than MCLOS. The missile is automatically guided by your cross hair sights and will adjust accordingly if you move your aiming. So hold your cross hair onto your target as the missile flies into the air to score a hit. The first guided missile of its kind was created by Nazi Germany with the Ruhrstahl X-4 wire-guided air-to-air missile in 1944. The X-4 lead to the predecessor of the ground-attack missile in the X-7 variant, nicknamed Rotkäppchen (Red Riding Hood). Neither of these missiles saw operational service in World War II before it ended. After World War II, the interest in missile stagnated in the Allies except to the French. France was the first to produce an anti-tank missile; named the Nord SS.10 and it was introduced to the export market in 1955. The missile was very successful, procured by America and the Israelis and was cost-effective, costing only £350 per missile. 30,000 missiles were produced by 1962. However, it was far from a perfect missile as it only had a range of 1.6 km and a longer effective range was desired. Later in the 1950s, better missiles were produced in all sides of the Cold War. The French followed up with the SS.11, with upgraded lethality and range. The British adopted the Australian Malkara and the Vickers Vigilant missiles, both respectable weapons of the era. The Soviets developed the 3M6 Shmel (AT-1 Snapper), though it seemed to be inspired from the SS.10 design. All these missiles followed a trend of being portable enough to be used by an infantry crew, yet powerful enough to destroy any tank of the time of introduction, which these missiles succeeded in. However, a problem arose in the guidance systems. The first missiles that came to be used the first-generation guidance system known as "Manual command to line of sight" (or MCLOS). The missile, once in flight, require the operator use a controller such as a joystick to steer the missile into the target. This was a troublesome system as it requires the operator to keep the missile sight on target while manually inputting the correction to the missile course, which was often not precise enough to allow for accurate aiming. This guidance system also left the operator exposed as the missile took its course, to the point that a counter to it was for tanks to simply bombard the position or kill the operator to disrupt the missile guidance. Most of the early missile systems like the SS.11, Malkara, and Shmel were based on this guidance system. The second-generation guidance system was the "Semi-automatic command to line of sight" (or SACLOS). Unlike the first generation, this requires the operator to simply keep the missile sights onto the target and the missile will correct itself through radio or wire signals. Another system used in this format was a laser sight or a camera view from the war head for a more direct sighting and aiming. This system was a lot simpler to use than the first generation, though still left the operator stationary and vulnerable. SACLOS made up the majority of missile designs used during later half of the Cold War, from the Soviet 9M14 Malyutka (AT-3 Sagger), the British Swingfire, the American AGM-114 Hellfire, and the BGM-71 TOW. The third-generation guidance system is the most sophisticated and modern of the missile systems. Using a laser or an IR sight to find a target in any environment, the missile uses a "fire-and-forget" system that allows for the operator to move from his position right after the missile is fired. This missile gives the operator a greater degree of safety than the others and can be found in most modern missile launchers, such as the FGM-148 Javelin in U.S. inventory. The missiles almost caused a collapse in the tank concept. The idea of the tank is that it would be able to resist and resistance and help the infantry break through the enemy lines. The missiles, however, gives the infantry a massive increase in anti-tank power and can destroy tanks very easily with their HEAT warheads. Tanks are unable to keep up with the more powerful HEAT rounds with their armour as more armour means heavier weight and placing enough armour on a tank to be resistant against the missiles makes them prohibitively heavy. Notable events to the tank development due to missiles is Germany's design of their Leopard 1 and the Soviet's discontinuation of the heavy tank series. The German Leopard 1 was made with minimum armour for increased mobility under the pretext that armour will eventually be outdated by more powerful HEAT rounds. The Soviet's discontinuation of the heavy tanks, logistics aside, was due to their growing vulnerability to the anti-tank missiles and thus, their entire existent as a heavily armoured break through tank is left meaningless if it can be stopped by a simple missile. Not all is lost though for the armoured forces. Conventional steel armour used since World War II became obsolete with improving tank armament and the missiles, but new armour replaced the old and made the tanks once again a dominant vehicle class on the battlefield. Composite armour, an armour made up of a blend of materials such as metal, plastics, and ceramics, prove to be much more resistant than conventional steel armour. The ammo composite armour excel against are HEAT, which was the primary tank ammunition used at the time and on every missile since. Composite armour gave tanks their main armour advantage back by being able to defend itself against missiles. Another armour that increases the tank's effectiveness in battle is the "explosive reactive armour" (or ERA). ERA uses the power of explosives to disrupt HEAT charges, but later models are able to interfere with any projectiles attempting to penetrate the tank armour. Thus, with these two armour type, tanks remain a dominant force of reckoning on the battlefield. Of course, with new protection, comes new ways of destroying that protection. Missile designers use a variety of ways to defeat the new armour such as the tandem-charge, which uses two HEAT rounds in one missile by using the first one to destroy the protection above the base armour like ERA and the second will attack the base armour straight-on. 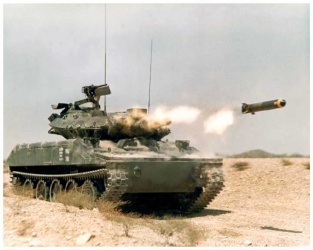 In response, ways to fight missiles by disrupting their guidance system also began such as electronic jammers, active protection systems, and smoke screens. Nevertheless, the missiles remain a large threat against armoured forces as it gives the infantry a cheap weapon able to destroy an expensive tank. An example of what one of the modelled, Anti-tank Guided Missile (ATGM) looks like in-game. 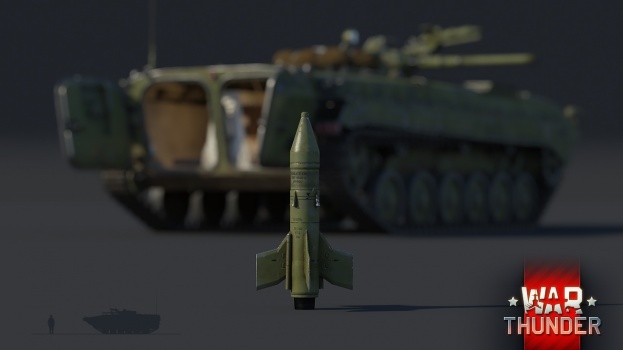 Fact: ATGM's representations are modelled in-game to their historical representations. Hogg, Ian V. Tank Killing: Anti-tank Warfare by Men and Machines. London: Sidgwick & Jackson, 1996. Print. This page was last edited on 8 September 2018, at 05:25.